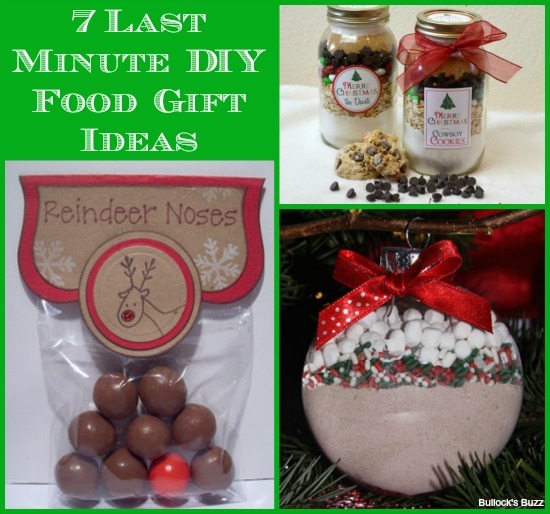 7 Last Minute DIY Food Gift Ideas: Gifts from the Heart and the Hands! Sometimes the best gifts are those that you make. Whether you are looking for last-minute gift ideas, or to make your own gifts, these seven last minute DIY food gift ideas are truly from the heart (and hands)! Compiled by the culinary team at Chef Works – the world’s leading supplier of culinary apparel for professional chefs and home cooks alike – each one takes just a few ingredients and even less time! Happy cooking and crafting! This is a quick, simple, and cheap gift, perfect for making in large amounts for a class or large group. 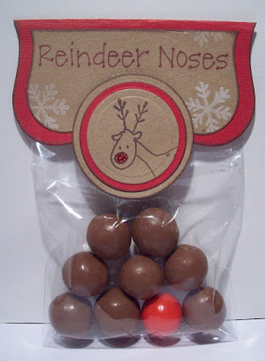 Simply fill a clear bag with 8 malted milk balls or other round, chocolate candy (these are the noses of Santa’s reindeer) and 1 red gumdrop ball (for Rudolph!). Create a cute label that says “Reindeer Noses” (such as this one) and staple it over the top of the bag to seal it off. There’s nothing that beats delicious hot cocoa on a cold winter’s day, but cocoa that doubles as a cute ornament is even better. You can find plain, clear, glass or plastic ornaments at your local craft store. Simply fill them with layered hot cocoa ingredients: instant cocoa powder, mini marshmallows, crushed candy canes, sprinkles, chocolate chips, or any ingredient you can think of that would be delightful in winter’s favorite hot beverage. Tie a ribbon through the top of the ornament, and you’re done! 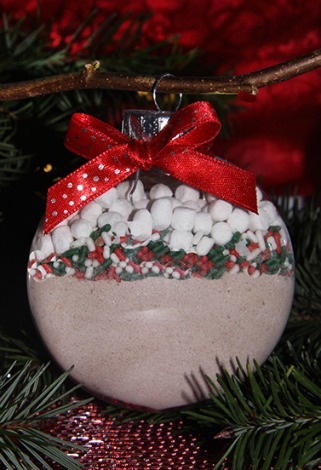 Gift the ornament by itself or give along side a mug or chocolate dipped spoon. 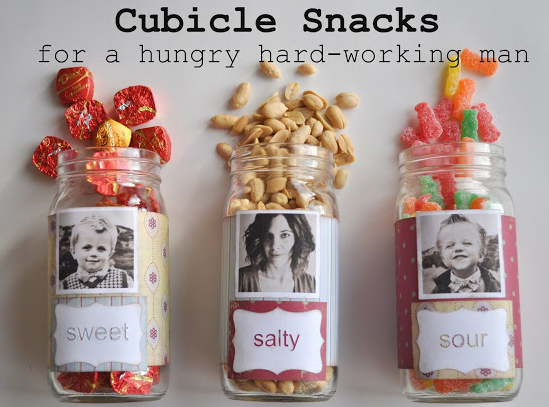 Everyone dreads going back to work after the holidays but the gift of cubicle snacks should make the transition a little more palatable. Simply reuse jars that you were going to recycle anyway, or go out and find matching jars at your local craft store. Fill them with healthy snacks like trail mix, granola, or kale chips for the health conscious, or gummy bears, M&Ms, or mini pretzels. Create fun labels and use decorative ribbon to give each jar a personal touch. 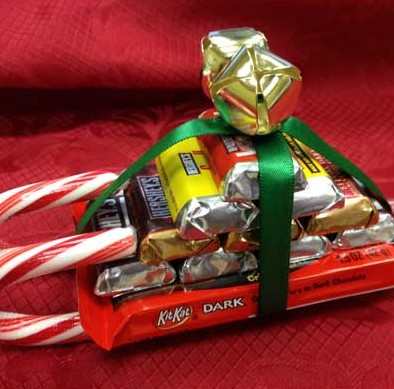 Use assorted sizes of candy and two candy canes to make each of these Christmas sleds. Place the two candy canes parallel to each other with the crook facing up (these will be the sled’s rungs). Stack the candy on top of each other with the largest on the bottom (think Hershey bar) and the smallest on top. The candy should look like a stack of presents on Santa’s sled. Secure your sled by tying a ribbon around the two candy canes and up and over the gift candies. Or use a hot glue gun to secure the packaged candy (be careful not to melt the chocolate!). This is the perfect gift if you would like to give cookies or baked goods as gifts, but you don’t quite have the baking “gift” yourself.  Instead, buy mason jars, glass milk jars, or other such jar containers and layer the ingredients necessary for a certain cookie or quick bread recipe. 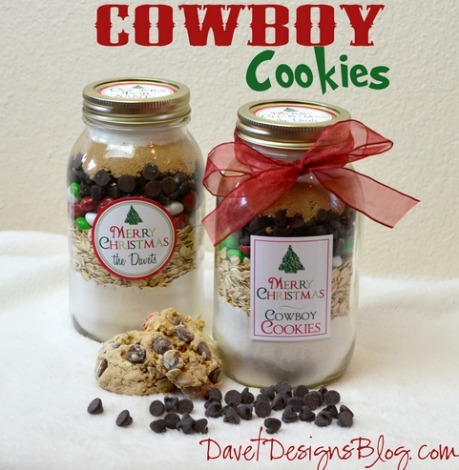 Find a favorite recipe (such as this cowboy cookies recipe) and layer the dry ingredients attractively in the jar. Use your creative talents to create a tag or sticker to attach to the jar with baking instructions and use ribbon and/or fabric to dress up the top of the jar. 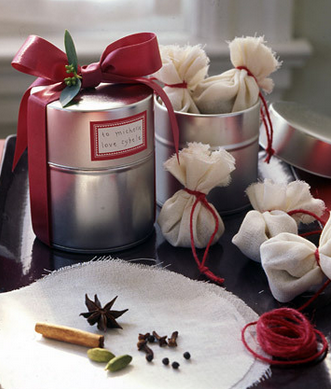 Create personal tea packets for the tea lover in your life. Cut two coffee filters to form rectangles, and then sew the three of the sides of each of these rectangles together to make a pouch. Fill the pouch with loose leaf tea of your choosing. Feel free to make it unique by adding spices, chocolate nibs, crushed candy canes, or whatever you can dream up (tip: make sure you try your creation to make sure it’s tasty before passing if off as a gift). Sew the open side of the pouch closed and fold down two of the corners to create the top, staple these down along with a piece of string. Create a tag to attach to the other end of the string. 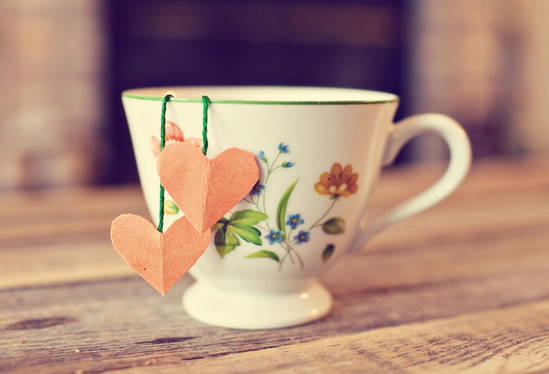 This could be as simple as a heart shape, or you could write little messages on each one (think of the positive messages Yogi includes on their tea tags and create your own personalized message).